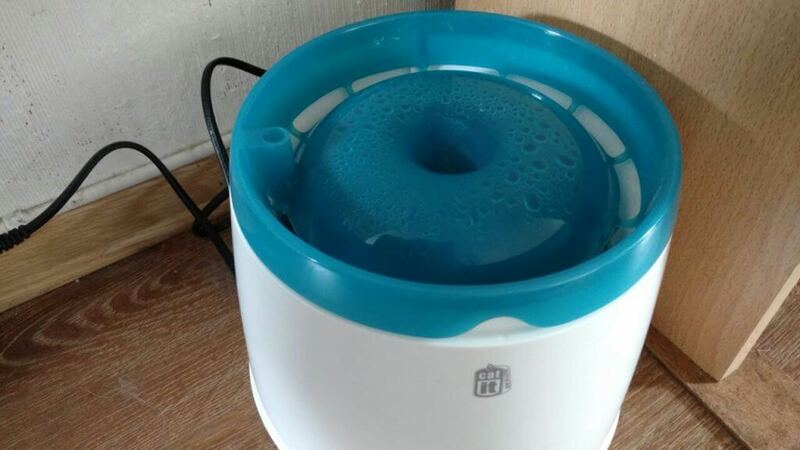 The newer model of the CatIt Cat Fountain is an easier to clean cat fountain that provides your cats in healthy clean water and offers this in an interesting way. 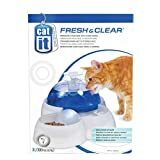 Here is our full CatIt Cat Fountain Review. The CatIt Bowl Cat Fountain is a fantastic way to add an interesting way of offering refreshing healthy water to your cats. It contains a high quality filter that makes sure that your cats get the best of the best! We got many cats in our house, all with different drinking preferences. Some like to use their tongue to lick it right out of the bowl, others use their paw to spoon it out while drinking it from their paw. Cats take a lot of dust, hairs, cat litter and food rests with in their fur and this ends up in the water. And the cats that paw-spoon their water intake, make a terrible mess around the bowls. On top of that we had bowls that often were tipped over by playful cats running through the house. Installing fountains from CatIt have solved most of these problems. The only minor problem we still have is that pawing water makes a water mess around the fountain. We got between seven and nine cats living in our house (depending on the amount of RSPCA projects), so we need to offer a lot of water to them in a lot of different ways. Even if you happen to have only one cat living in your house, a cat fountain will be the solution. Access to adequate and clean water is very important to your cat(s). Drinking enough water can prevent them from getting illnesses such as urinary tract infections and kidney disease. If you give your cat(s) dry kibble, they will only get as little as 30% of their water need and need to drink a lot to get their daily intake. Even if you give your cat(s) wet food (at 78% water), your cat still needs to drink water. 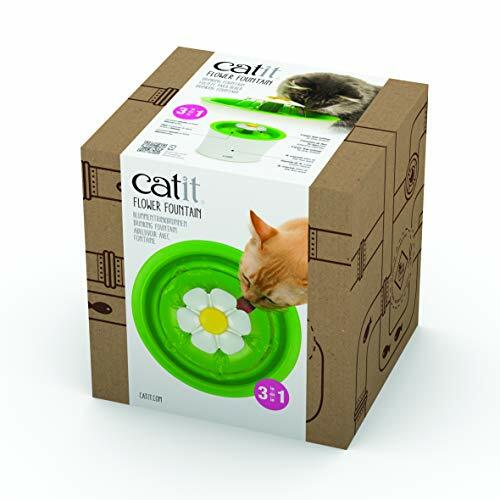 CatIt currently has at least four different models of cat fountains, three of them are very similar in that they are a round bowl with a different way of providing the water to your cats (or small dogs). They also have a fountain available with a dome. We did a review of the CatIt Dome Cat Fountain too. In this article we will review the round bowl version and show you the three different models of this one. We own currently one of the models, but plan to have several different models in the house to provide our cats in different ways to drink their water. The CatIt Bowl Cat Fountain has been developed a lot over the past years and is now available in a variety of designs. Even though these older models are still available through the various amount of stores, the main marketed cat fountain is the CatIt Senses Flower Fountain. We have the blue 2L smaller CatIt Bowl Cat Fountain, but will also compare with the newer 3L CatIt Senses series models available. This model of the CatIt fountain have we got installed for just under a year. We have used the dome fountain for more than six years and were so happy with CatIt that we have bought this model as well. While the CatIt Dome Cat Fountain has a dome, this CatIt Bowl Fountain is of a much simpler design. Water is stored directly under the fountain part and is still pushed up from the middle by a pump. The fountain also contains a filter to clean the water from dirt and impurities. This model is however quite high in design. It works fine for adult cats and small dogs, but not so well for kittens. Our kittens just stand on the edge of it, or stand in the middle of the water to reach it. The CatIt Bowl Fountain has been produced in several different designs in the past years. The manufacturer states on their own website that they have now replaced all previous designs with the CatIt Senses Flower Fountain. The new fountain model fits in with CatIt’s own Senses system (a series of different products to entertain cats). We apparently got an older model of the fountain that contains only a coal foam filter and has a 2L container. The newer model has a more advanced filter for bacteria, chloride, hard water and debris and comes with a larger 3L container for water. Although they have stopped marketing for the older models, the older models are still available for sale through the many stores, such as Amazon. In functionality they are all pretty much the same. The main thing they have changed since then is to offer again different options for different drinking styles as well as adding a better filtering system. I will definitely get the flower fountain soon too. As you can see, the new Flower Fountain adds the option to drink water in three different ways. 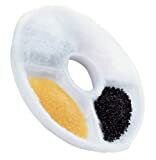 It also adds better filtering that can remove the hardness in water and provide in even healthier water for your cats. To refill this fountain, you simply can take a carafe or any sort of bottle or bowl and fill it with water. Than you can pour this out over the top of the fountain – even when it is running! There is a little water floater that shows you the level of water in the fountain. Naturally when the red floater is all the way up, you can stop filling. 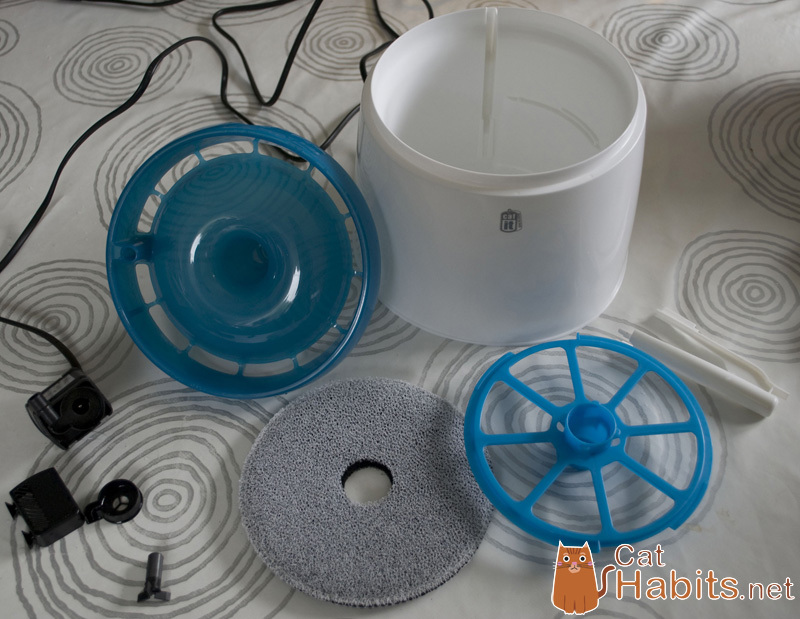 Cleaning the CatIt Bowl Cat Fountain is a lot easier than with our CatIt Dome Cat Fountain, because there are less parts to clean, but it can still be a bit of a challenge when you wait too long with cleaning and there is algae buildup in the system. The motor can be taken apart in four pieces and can be cleaned independently. The fountain has a bowl, a filter holder, the filter, a holder to keep the cable in place and the fountain top part. The Flower Fountain has also an optional flower top part with bud. Below you will see the parts that come with our blue 2L fountain. All parts should be cleaned with a cloth and some mild soap under warm water. Make sure you rinse it properly afterward, to prevent soap rests to get into the motor or your cats stomach. Alternatively you could put most parts (not the motor parts) into the dishwasher. I clean this fountain every 1-2 weeks, while I have to refill the bowl every other day. Since refilling is easy and effortless, it doesn’t take a lot of time and doesn’t feel like a chore. As the CatIt Bowl Fountains are all quite alike, showing one of the video’s about cleaning will suffice. Also the CatIt Bowl Cat Fountain comes with a replaceable filter. This filter is round in form with a hole in the middle. It fits over a plastic holder that slides into the top compartment. The filter separates water from impurities in the water, hairs, dust, cat litter and food rests. The filter consists out of a compartment with coal particles and a foam layer that stops all dirt. 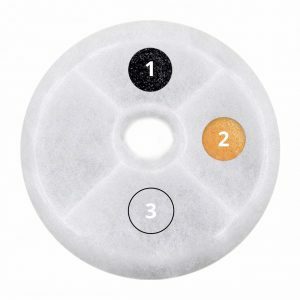 You need to replace the filter at least once in the three weeks or when there is a decent amount of buildup of dirt. At my 1-2 weekly cleanup, I tend to rinse the dirt off with my fingers under the tap. At the third week I completely replace it. Replacement filters can be bought online here. The newer models (Senses series) come with a filter that can also take care of hard water, if you happen to live in such area. Hard water contains higher amounts of calcium and magnesium that can be harmful to your cats kidneys. The filter also takes care of the possible added chloride in water. All the different models with the similar bowl design, have different filters, which I list below. A bit high in design for kittens. 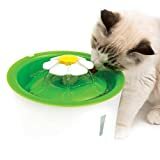 The CatIt Bowl Cat Fountain, especially the newer CatIt Senses Flower Fountain, is a fantastic way to add an interesting way of offering water to your cats. We have many years of experience with CatIt Cat Fountains and are very pleased with their qualitative products. 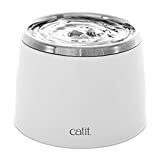 For those struggling with keeping their bowls clean or not tipping over, adding a robust CatIt Bowl Cat Fountain is an excellent way of adding healthy and clean water for your cat(s). It sure has helped us! ====> Get The CatIt Bowl Cat Fountain Right Now!